by Mary Christina Wood. New York: Cambridge University Press, 2014. 436pp. Cloth $115.00. ISBN 978-0521195133. Paper $45.00 ISBN: 978-0521144117. 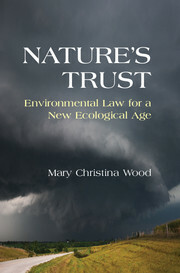 Climate change is the defining challenge for modern environmental law, and Mary Wood’s NATURE’S TRUST presents an ambitious argument for why modern environmental law has failed and why we need a “Nature’s Trust.” Her book “aims to bring environmental law face to face with the new ecological age” and “presents a transformative framework – Nature’s Trust – to fundamentally redirect government’s environmental policy from its present course of legalizing colossal damage to a project of epic restoration” (p.5). Animated by our consumption of nature’s capital – the ecological services provided by our air, land, water, and wildlife resources, and concerned that we are depriving future generations of those resources, Mary Wood constructs a novel legal paradigm based on the traditional principles of fiduciary obligations to protect our ecological resources as well as secure future generations’ ability to enjoy those resources. This new paradigm relies on active citizen involvement with the courts to constrain governmental actors from dissipating our ecological trust assets. And it would impose on those governmental actors a fiduciary obligation as a trustee to protect the assets for the “public” as the beneficiary. A dominant theme permeating NATURE’S TRUST is that federal environmental agencies have been “captured” by the industry they regulate, and that courts contribute to this phenomenon by affording those agencies “deference” when parties challenge agency decisions. Although the Justices on the modern Supreme Court are currently engaged in a dialogue about the breadth of deference afforded agencies (this became evident in the parry between Justices Scalia and Chief Justice Roberts in CITY OF ARLINGTON 2013), the extant judicial deference doctrine is premised upon a few core principles. The doctrine assumes, when Congress has not spoken to the precise issue being addressed, that it implicitly intends to delegate to the administering agency the authority to make a reasoned decision about how best to address that issue. The application of deference further treats agency officials as “experts” capable of making policy decisions that are beyond the ken of the judiciary. This general acquiescence to agency decisions, Mary Wood opines, is both destructive to the environment and to democracy itself. It is environmentally deleterious, she suggests, because federal environmental agencies are not maximizing the potential under modern environmental statutes to address critical environmental threats, such as from climate change. Instead, they are “often operat[ing] in tight alliance with industry and private interests” (p.50). Here, NATURE’S TRUST accepts the theory of agency “capture:” that as environmental [*330] agencies have become too cozy with the regulated community those agencies have softened their implementation and enforcement of the 1970’s era environmental statutes. This, she concludes, then vests the Executive Branch with too much power, tilting the balance of power in our constitutional structure (p.53). And Part 1 of NATURE’S TRUST chronicles how a too powerful Executive Branch has allowed politics and influence to shape decisions “to favor industry over the public interest [and] threaten[ing] democracy itself” (p.102). The result, therefore, is that agencies promote Nature’s destruction rather than retard environmental threats (pp.50-51). Part II then introduces an alternative paradigm for protecting ecological resources, for both today and future generations. Wood here presents her provocative thesis. Memorializing much of her well-known prior work in the book, Wood argues that the judiciary should hold accountable governmental actors when their actions threaten ecological resources, including our climate. Courts can accomplish this by establishing “Nature’s Trust.” When a governmental actor’s actions threaten ecological resources, courts should apply traditional fiduciary obligations principles applicable to a trustee responsible for protecting particular res. Expanding the work of one environmental law’s greatest scholars, Joseph Sax (1970), Wood invokes the “public trust” doctrine, an ancient principle that historically held that the government holds certain resources (navigable waters, lands under them, and accompanying resources) “by virtue of its sovereignty, in trust for the public” (ILLINOIS CENTRAL 455). Relying on the Supreme Court’s decision in GEER (1896) as well as other sources, she would enlarge trust resources, the res, to embrace other ecological resources – appreciating how ecosystems encompass an array of interconnected air, land, water, and wildlife resources. Nature’s Trust could then protect trust property through a judicially “enforceable ecological duty” (p.120). Courts could fill the gap created by congressional malaise and agency capture by applying a robust public trust doctrine. The judiciary, employing typical common law powers and crafting fiduciary obligations, can define the contours of the enforceable obligations imposed on governmental actors to protect ecological trust assets from waste. “Specifically,” Wood argues, “their conduct must meet strict fiduciary standards of asset protection, restoration, and the duties of loyalty and prudence, among others” – in effect, “a gold standard of fiduciary care” (p.139). Yet, the book arguably avoids the minefield of judicial bias, whether at the state or federal level. Some scholarship suggests that a judge’s political or ideological preferences affect whether they side for the agency or not in a particular dispute. Indeed, Jason Czarnezki suggests that some judges “strategically use” the deference doctrine “to achieve their perceived environmental policy preferences” (Czarnezki 2008). The Supreme Court’s deference doctrine acknowledges this, by suggesting that it is better to have agencies, under the auspices of a politically accountable Chief Executive, render policy choices rather than a politically insulated judiciary. But if the deference doctrine is somewhat [*331] malleable according to ideological or political bias, it is not certain why a judicially constructed Nature’s Trust doctrine would not be equally susceptible to judicial whim. But Wood argues that, if accepted, a Nature’s Trust paradigm would promote democracy, as well as consistency with what Professor Wood terms “natural laws,” morals, and ethics. She explains, in Part III, how democratic principles emerge by affording citizens the ability – and implicitly the civic obligation – to protect resources through the court system. Because through the theory of the social contract the people never divest themselves of the authority to manage ecological assets “in a way that would jeopardize present or future generations or compromise crucial public needs (p.129), democracy is furthered by allowing the public the ability to protect their natural right. Ethically, the trust could afford “nature” legal protection (p.270), while simultaneously galvanizing religious organizations on behalf of the environment (p.277). Others, such as Mark Sagoff, similarly observe how “[t]he covenant we have made with nature, which is as much an obligation to use well our natural environment as to protect it – and, in any case, not to destroy it wantonly or in a wasteful manner – historically had religious rather than economic or even literary and artistic origins” (Sagoff , p.141). Wood further infuses her arguments with support from “Nature’s Laws,” or “‘the law which natural reason appoints for all mankind’” (p.126). A book this ambitious necessarily paints broadly, occasionally shying away from nuances and risking statements that may fade with shifting winds. The assumptions about agency capture, supported by illustrations during the second Bush Administration (p.19), do not necessarily suggest that the same biases informed agency officials during either the Clinton or Obama Administrations. One example is that the book discusses President Obama’s “climate complacency” (pp.19; 47; 82), and yet since the book’s publication President Obama’s climate initiatives have become pronounced, aggressively pursuing administrative actions (without Congress’ aid) to arrest the threat of rising greenhouse gas emissions. So too, NATURE’S TRUST champions “Atmospheric Trust Litigation,” a litigation campaign promoting the theory of Nature’s Trust, and yet that campaign has so far been rejected at the federal level (ALEC L V. MCCARTHY, 2014) and not secured any meaningful victory at the state level. At a more fundamental level, by transforming arguments about how the government historically regulated property to arguing, in effect, for a communitarian value that protects present and future “community” “property” values (p.266), rather than just justifying the exercise of governmental power, the animating theory of NATURE’S TRUST if extended beyond the environmental realm could have devastating results for liberals. Overall, however, this book presents ample arguments supporting the need to re-visit whether our modern environmental laws are achieving their objectives, and protecting ecological assets for present and future generations. While it seems unlikely that a Nature’s Trust paradigm will resonate with many, or garner sufficient support in the near term, the book offers a forceful [*332] argument against maintaining the status quo and exploring the need for a next generation of environmental law, such as a NATURE’S TRUST, that will provide the public with the ability to protect and restore ecological assets. Czarnezki, Jason J. 2008. “An Empirical Investigation of Judicial Decisionmakng, Statutory Interpretation, and the CHEVRON Doctrine in Environmental Law.” UNIVERSITY OF COLORADO LAW REVIEW 79: 767-823. Sagoff, Mark. 1988. THE ECONOMY OF THE EARTH. Cambridge: Cambridge University Press. Sax, John L. 1970. “The Public Trust Doctrine in Natural Resource Law: Effective Judicial Intervention.” MICHIGAN LAW REVIEW 68: 473-566. ALEC L. V. MCCARTHY, Civ. No. 13-5192, D.D.C. June 5, 2014. CITY OF ARLINGTON V. F.C.C., 133 S. Ct. 1863 (2013). GEER V. STATE OF CONNECTICUT, 161 U.S. 519 (1896). ILLINOIS CENTRAL RAILROAD CO. V. STATE OF ILLINOIS, 146 U.S. 387 (1892). Copyright 2014 by the Author, Sam Kalen.